This is an anti-tuberculosis chart, with rows of pictures and corresponding Chinese text. 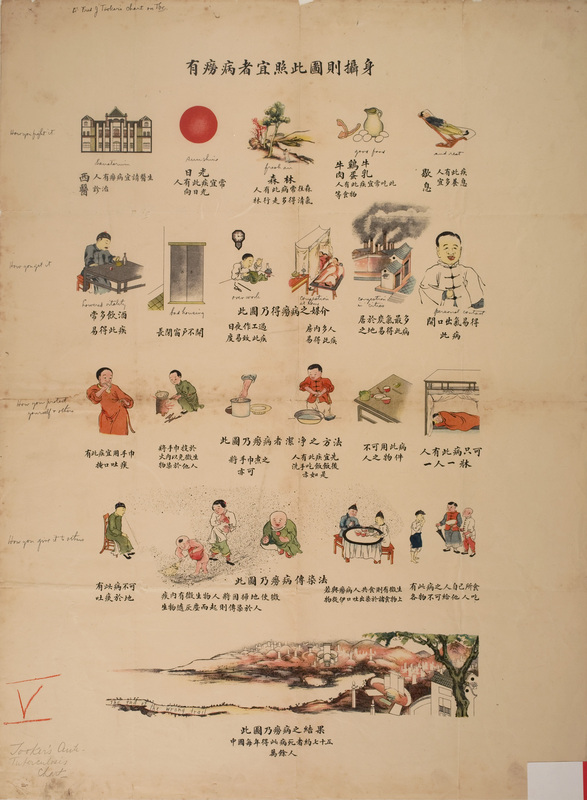 The poster shows how to fight tuberculosis (sanatorium, sunshine, fresh air, good food, and rest), how you get tuberculosis (lowered vitality, bad housing, overwork, congestion at home, congestion in cities, personal contact), how to protect yourself and others, and how you give tuberculosis to others. There is an image of a cemetery at the bottom, and the poster states that 750,000 people die from tuberculosis every year. Top row, left to right: Western medicine. People with tuberculosis please consult a doctor. Sunlight. People with this disease need to get more sunlight. Forests. People with this disease should often go to the forest to get clean air. Beef, egg, and milk. People with this disease should eat these food often. Rest. People with this disease should rest more. Drinking alcohol often makes you more susceptible to get this disease. Keeping windows closed all the time makes you more susceptible to get this disease. Overworking makes you more susceptible to get this disease. Many people living in the same room makes you more susceptible to get this disease. Living in places with the most carbon makes you more susceptible to get this disease. Breathing with an open mouth makes you more susceptible to get this disease. If you have this disease, you should cover your mouth with a handkerchief when coughing or spitting. Burn the handkerchief to avoid the spread of virus. Boiling the handkerchief also works. People should wash their hands before and after meals. Do not use the patient’s belongings. People who have the disease should sleep alone. If you have this disease, you must not spit on the ground. When swept, the virus in the spit will spread in the air and infect other people. If you share food with the patient, the virus can be transmitted through the saliva on the food. People who have the disease cannot share food with others. Bottom: This shows the result of tuberculosis – More than seven hundred and fifty thousand people die from this disease every year in China.